Healthy Living | Why Shouldn't We? Experiences and reminisces from community projects. Looking back, it was ridiculous . . . but a unique experience . . . in a good way . . . mostly. Trick or treating in a large city is always a little different, especially when it’s a northern Midwestern town. Saturday I saw how Halloween works for some kids in Chicago. Lincoln Square, the actual square that is, is a segment of road which encourages pedestrian traffic; the road is lined with a number of small shops and restaurants. On Saturday the square hosted a little Halloween event; kids went trick or treating along the shops, showed off their costumes, got some candy, and broke up the monotony for the folks working at the sandwich shops. It was the first Halloween in a few years that wasn’t extremely cold or snowy. Unfortunately, it was rainy; more than a drizzle, but not quite a downpour, just constant wet; which meant everyone was damp – and cold. So, kids changed their heavy winter coats for raincoats. Mostly, I couldn’t see more than make-up or a mask, and the fringe of a costume hanging out of the bottom of a raincoat. There was however a lucky kid or two who was able to show off his or her costume, because an umbrella was being held over his or her head. That way the young one could hold both the bag of candy and the lightsaber. It didn’t matter that mom or dad was getting soaked; the kid was “Frozen”, and the world knew it. Oh, the sacrifices parents make! So, I headed to the club on Saturday, trying to protect my gear from the heavy drizzle which was dogging those of us who wanted to be outside. Once inside the club I of course asked the obligatory questions: “This thing is outside. Right?” and “You do know it’s raining outside?” Too which I was told yes, but the organizers had a tent for us, so we would see what happens. I always love these situations. But, hey, nothing to do but go along with a good attitude. 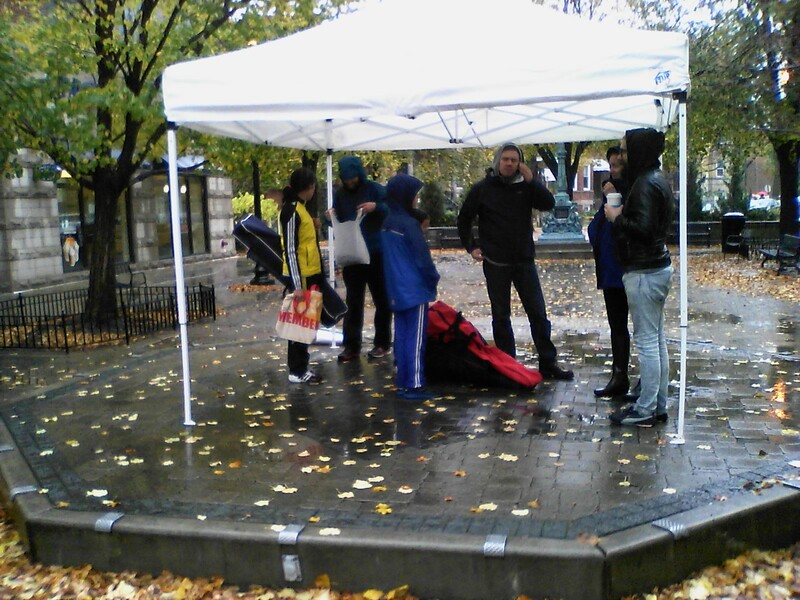 A group of about 10 of us, adults and youth, fencers and parents, headed into the damp void of Lincoln Square. We got to the square, rounded a corner, and just cracked up. We all did; not one of us could hold the laughter in. When I was told there would be a tent I imagined a nice large catering tent where we could do the demo, while people stood underneath to watch, and we all would be safe. What we got was a picnic tent, about 8 feet by 8 feet, and not even 6 ½ feet tall. It did keep us dry though . . . if we didn’t stand too near the edge. We waited in the cold for a bit, but not too long, until our appointed time. For the first time in my life I was glad we wore heavy jackets to do our sport. As we started there were maybe six people standing in the rain watching us. But you know what? Sometimes things just have to be done. Plus, going in with a good attitude means good results. So we spoke a bit about the sport. And, we got one person to put down her umbrella and hit us. And, we even figured out a way to have a couple of youth from the club fence a little. Truth be told, the half hour or so we spent out in the cold wetness went by pretty quick, and I smiled most of the time. Afterwards, as I sat and warmed up with perhaps the best cup of coffee I’ve ever had I realized somehow I strangely enjoyed the absurdity. And, I didn’t even mention how inspired I was by how determined the kids were to go trick or treating through the rain. I don’t know if one of the few people who watched us try to fence will come to the club. But I do know it was a unique experience, of which when I think about, will make me smile. There are times when you agree to lend a hand knowing you’ll have some fun, only to find it is ridiculously more than you could have imagined. Last week and this I am challenging the kids to think about the produce they eat. As part I asked them to list the steps that it takes to get any particular vegetable to their homes. Coming into this project I wanted to emphasize the amount of resources that are used to grow our food and get them to us. I wanted us to think about how much oil we use to grow and transport the crops. Of course most of the farm machines use oil, but we also transport our crops farther than we really should. In the U.S. almost all of our produce, other than corn, comes from California; most of the oranges sold in Florida for example. Huh? Let’s take citrus grown in a region that is experiencing a huge drought and transport it to a place known as “The Citrus State.” That makes no sense at all! Some of the steps we came up with were applying water, pesticides, and fertilizers. I want the kids to understand that even though it is obvious, it isn’t so simple. The applications do use resources. However, cleaning and pumping water uses resources beyond just the water. Pesticides and fertilizers are made from chemicals, industrial waste, and petroleum, all of which can easily run-off into our waterways. We learned that often one action has many branching impacts. The kids also came up with some creative answers, which led to talk about other issues. One part of getting the produce home from the store was placing it in plastic bags. This allowed the kids to fill each other in on the new bag ban in Chicago. Starting in August bags were banned from many stores. This is great; except for the fact that it only bans bags at larger and chain stores, not restaurants or small shops. It also only bans bags that are thinner than a certain amount. So what did the stores decide to do? Give out thicker bags, what a horrible loophole to find. One of the more, um, original thoughts came from the middle school boys. They determined that the last step was to flush our waste. While this is perhaps a topic we don’t talk about, it is an issue that we should consider, and this original idea gave us an obvious reason to do so. The amount of water that is cleaned, just so we can use it in the toilet is amazing. According to the EPA toilets account for 40% of indoor home water use. This led to a whole water cycle talk. It is funny how a conversation about gardening winds up leading to talking about plastic, and human waste. This is why I love community work: I always find new issues to learn and teach, and how we are all interconnected with our actions. 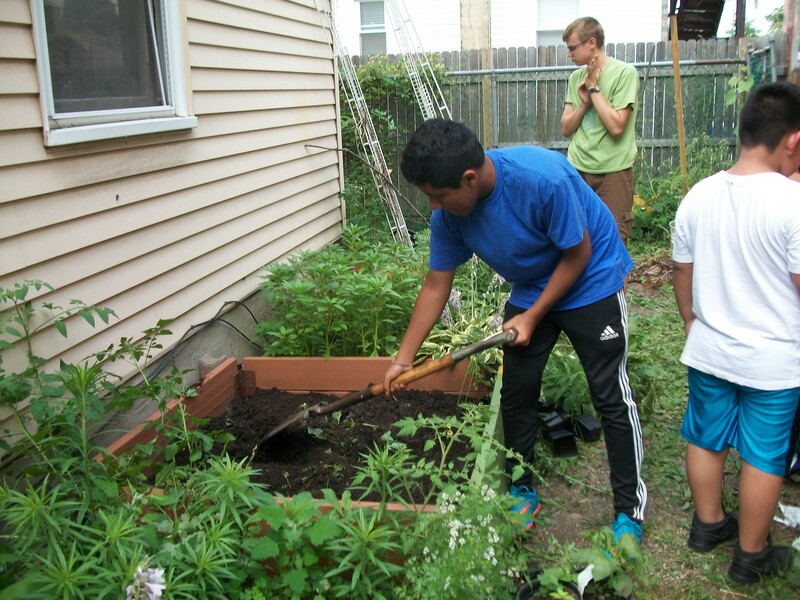 Last week we mostly maintained the vegetables that were planted before camp began. 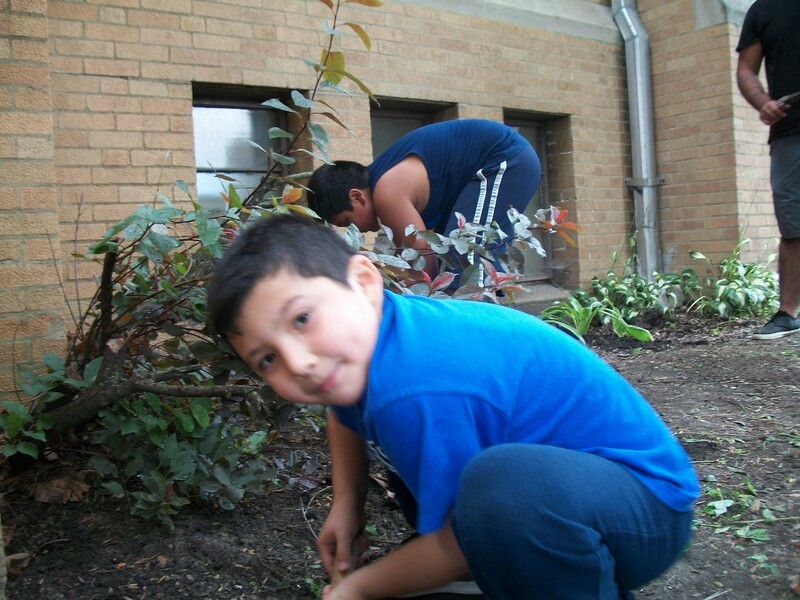 We were pruning, stringing up tomatoes, and weeding. 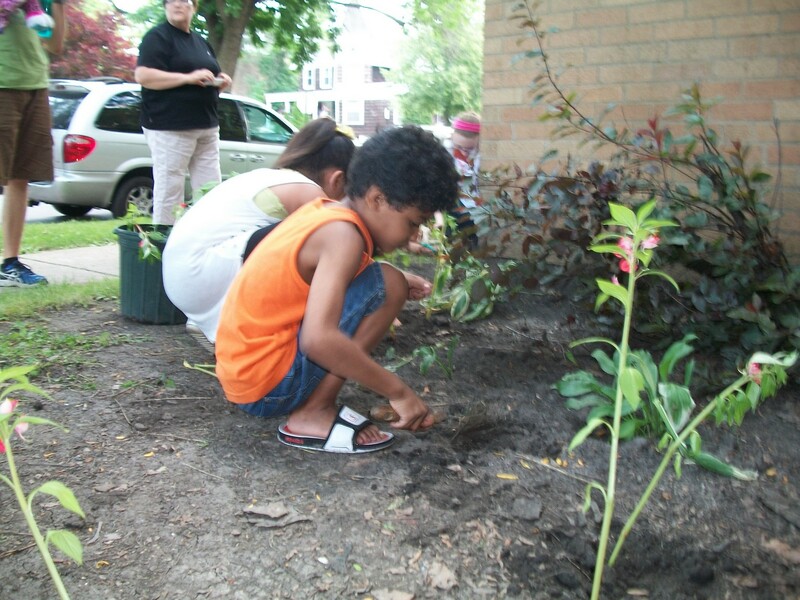 I am trying to teach the kids how to care for the garden in a way that is environmentally sustainable, and why this is the better way to garden. It’s funny that many of the kids first think to throw the weeds in the trash; they don’t realize that they have. 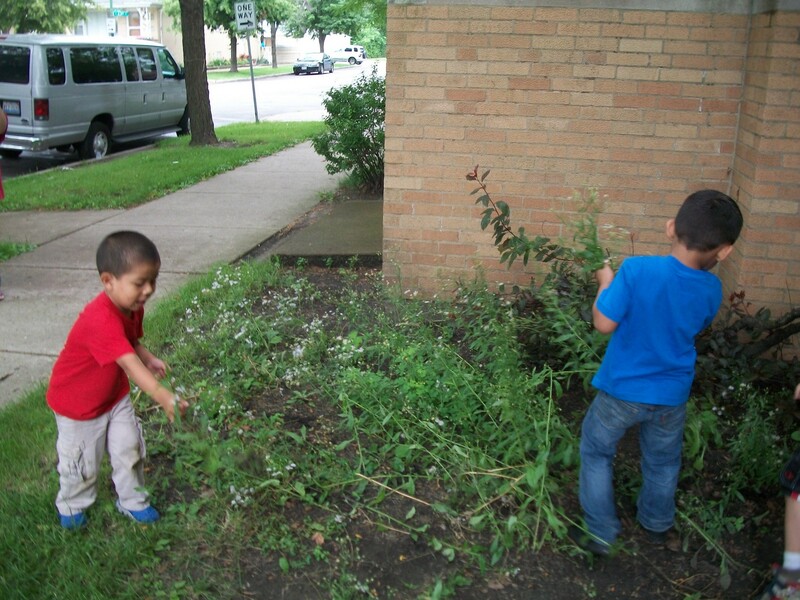 Showing that the weeds are useful helps motivate the kids to do the work that needs to be done. I feel that many kids will do the hard work that is needed if they know why. One of the lessons I am trying to impress is that we don’t have as many options of vegetables and flavors as we think. Often factory farms use seed from large companies. Most of these seeds have been modified to increase yield or color or flavor or some other characteristic that is appealing to farmers or consumers. This has resulted in the loss of diversity of vegetable types, and a seed that produces sterile seed in its vegetable. Over the past 100 years we have lost over 95% of vegetable varieties. The graph below, from National Geographic, shows the diversity we used to have. I almost cry at the thought of the many flavors we will never get to taste. Many farmers take pride in saving the seed from their best vegetables, and passing that seed on through the generations. But when the seed gets cross pollinated with a GMO seed from a nearby farm and the fruit becomes sterile, or the farmer gets sued by the big seed company, the farmer has no choice but to buy new seeds from the big company. And his or her variety of vegetable that has been grown for 150 years is lost forever. Now the new seed doesn’t just grow on its own. Each seed will only grow with a specific fertilizer, and are prone to specific pests, so they need specific pesticides. Chemical fertilizers and pesticides pollute our land and water both as they are being made and being applied. 55% of the US waterways are in poor condition for aquatic life, according to the EPA; if they are poor for animals they have to be worse for humans. Also, chemical fertilizers actually deplete the soil of nutrients; after the harvest all the nutrients are gone, and new fertilizer must be added. It would take many years and lots of organic fertilizer to make land self-sustainable again. So, now the farmer has to rely on the big seed company to provide seed, which they can’t save, and has no choice in what fertilizers and pesticides he or she uses. The farmers no longer have any choice for their businesses, and we have no choice of fruit or vegetable variety. While we are becoming more aware of the lack of variety and the health impacts of factory farming, choice is not always available. Low income areas have fewer grocery stores and farmers markets. The stores that are in these areas have less choice in produce. When someone wants to have vegetables that have been grown in a healthy way they have to travel farther and pay more than at their local store. Extra time and money is not always available to people who are working two jobs to provide the basics for their families. 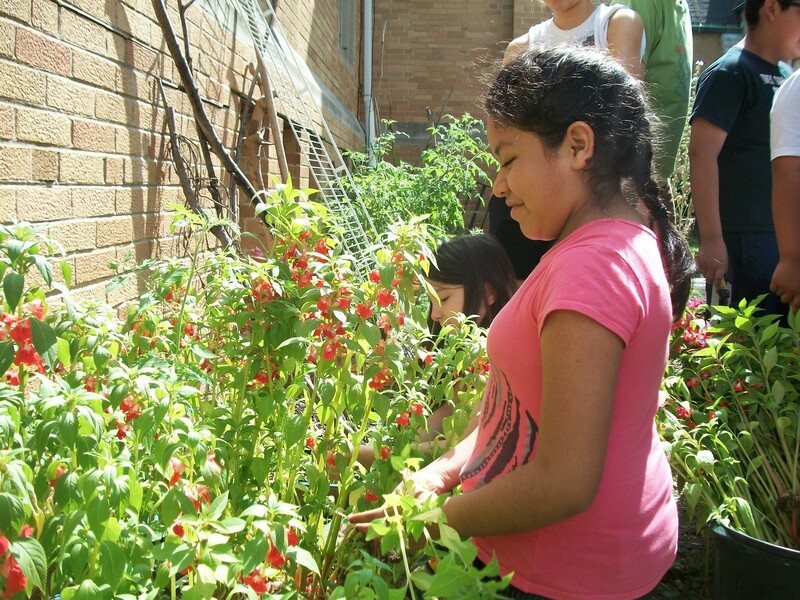 By teaching the kids how to grow their own food we can provide them with choice. They will have the skills, and hopefully be inspired to grow their own vegetables. You can help too; just buy organic and heirloom vegetables. By buying better we support farmers that are fighting back against the big seed and farm corporations that care only about profit. As the responsible farm businesses grow the price of good food becomes cheaper and more readily available to all. I am really enjoying the camp garden program; not only am I helping to provide fresh, diverse, organic food to people who don’t usually get it, but I am also able to talk about one of my biggest passions: organic, sustainable agriculture. This is a key to solving our global food crisis in a healthy way. Plus, it just tastes better. 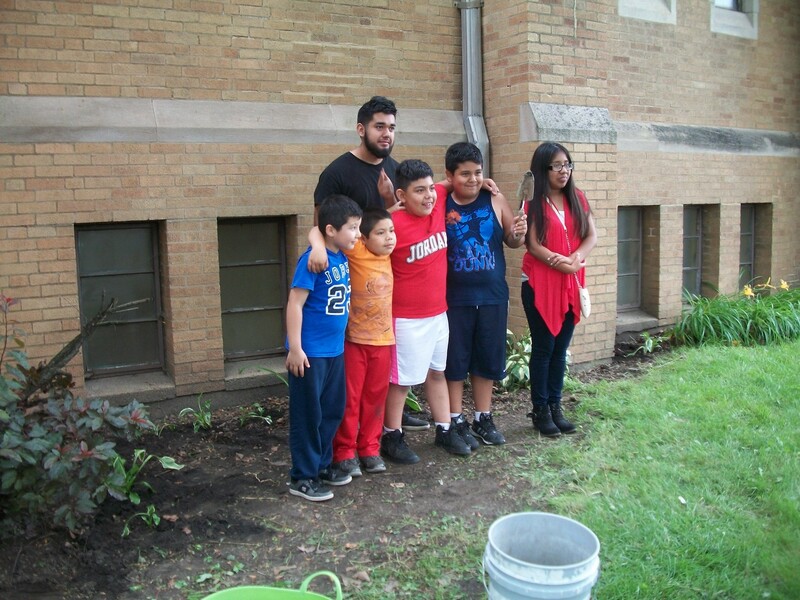 The past two Thursdays I have been helping with a youth program in Chicago Lawn. They have a garden for their food pantry, and throughout the summer I will be having the kids maintain the garden, and teach them about local food, health, sustainable living and all that stuff. These kids are really smart, and many have grown their own vegetables; they just don’t know why. So, we will have fun working together, learning about why and how to grow vegetables in healthy, sustainable way. There are already some vegetables planted. 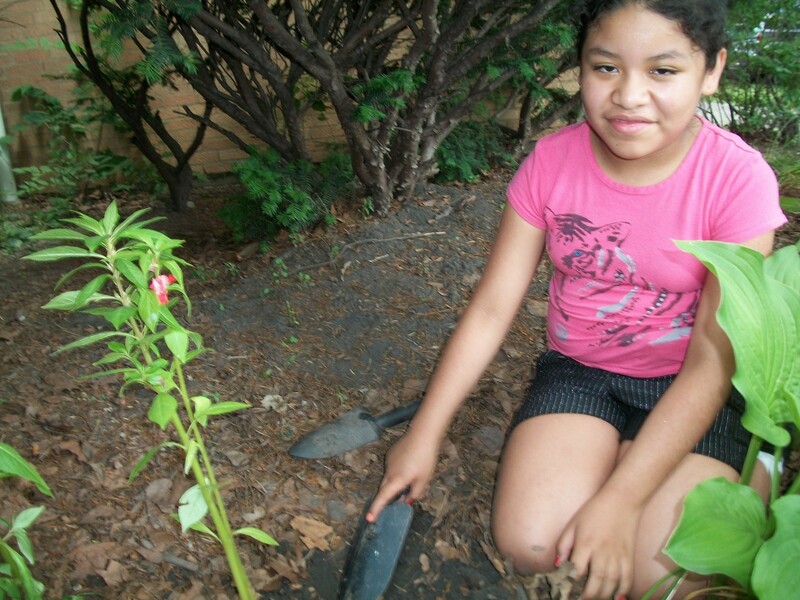 They were planted by Rosa, a volunteer at the food pantry and the organizer of the program. She does so much work for the community, and is always so happy; she is a real inspiration to me. This week we mostly thinned some flowers that were growing in the vegetables beds and planted them around the church. Then we added some good organic manure to the beds and added some seed for late season crops, lettuce and squash. Also, we have started a compost pile, and over the next few weeks we will build a proper system. The vegetables that have been planted need some maintenance, so we will focus on that next week. We were lucky to get seed donations from Charles Hart Seed Co. (hartseed.com/) who provided us with non-GE seed for many vegetables, and Gary Ibsen’s TomatoFest (tomatofest.com/) provided us with great heirloom tomato varieties. My mouth waters with the thought of tasting the vegetables. The kids get real excited about the planting, but are not big fans of weeding, so I will have to think of ways to motivate them. It is always fun seeing how the kids interact, trying to get the other kids to do the boring tasks. One thing I learned this week is that dude is making a comeback. “Dude, get the compost for this bed.” “I mixed the soil for the other bed, you do it dude.” I hope all the dudes get to love gardening . . . even the more monotonous tasks. That’s fun too. 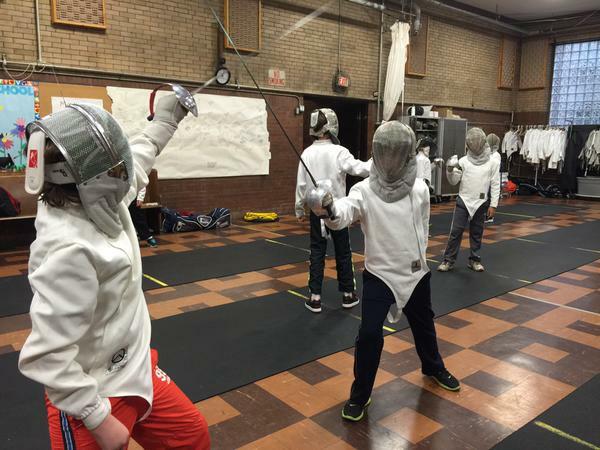 Last week I spent a few days helping at a camp put on by Lincoln Square Fencing Club, and the kids weren’t the only ones having fun. Plus it did so much for my ego to show off to 8 year olds. I know that sounds pretentious, but as I was completely worn out one day I began thinking about why I was there. Although it was fun, most of the time, and there is a lot of self-importance with teaching, there was another reason I was helping. It hit me suddenly: I was learning and problem solving. When showing a skill, I had to do it correctly and explain it properly, which got me to think about and fix the little oddities that crept into my fencing. Even just watching the kids learn was enlightening. Kids think and learn in so many different ways, and have varied levels of attention. So we needed to teach the same skills in different ways; doing rote drills for some, while turning the skill into a game for others. Each child had different abilities and tendencies, it was a challenge to find their individual capabilities and translate that to effective fencing technique. It was fantastic to learn multiple ways to both teach and learn. We had a lot of fun too. Most days started with a fun game or just finding ways to warm up our bodies while being goofy. It was sickeningly cute to watch the two smallest girls running around during dodgeball . . . while holding hands. As the morning progressed we would move onto a fencing drill or game. It was always fun to beat up on the little kids. Most of the kids would be intimidated by me before the drill started. But it was great to watch them try the action, and realize that with a little effort they could beat a big guy like me. Even lunch was fun; I would get to listen to what all the kids are talking about, which for kids at fencing camp is hacking. Now mind you 10 year olds don’t really know how to hack, but they do know how to change posts on Wikipedia, and they are proud of it. Let’s hope they grow more of an interest in fencing than actual hacking. Overall we learned a lot and had a ton of fun. And I get to do it again in a few weeks. Quite often we underestimate children, but with a little freedom to try they can figure out most things life has to offer – and do so in a way we adults never would have thought of. 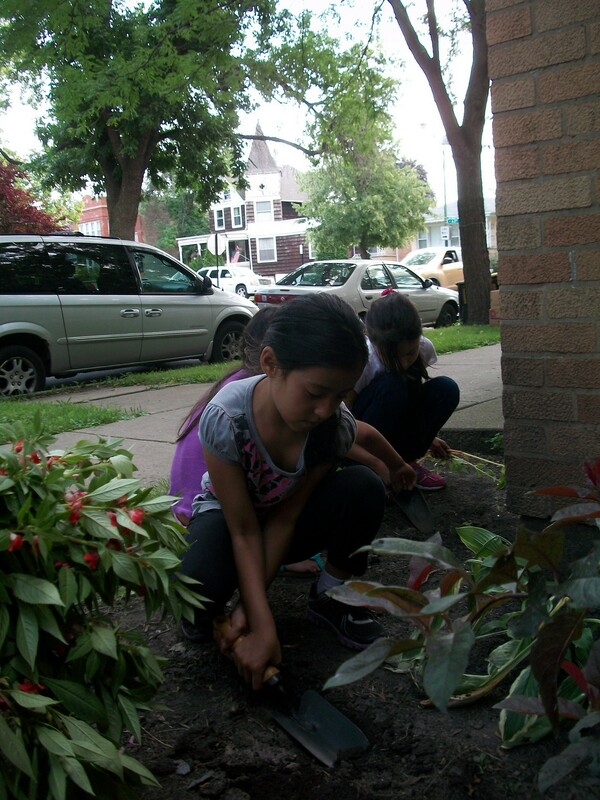 Throughout the summer I will help at the camp in Chicago Lawn; teaching the kids to maintain the garden for the food pantry. The garden needs lots of love and support, if you can provide either let me know. The week of August 3 will be fencing camp v2. Let’s Get Beyond the Fear. Why Solar? Keep Me Healthy; Preserve My Wilderness!